Six-year-old Adelei Mosteller, of Manhattan Beach, has been swimming since before she could walk. When Adelei was six months old, her mother Brandy enrolled her in an infant swim rescue class, which taught her to flip onto her back in the water. 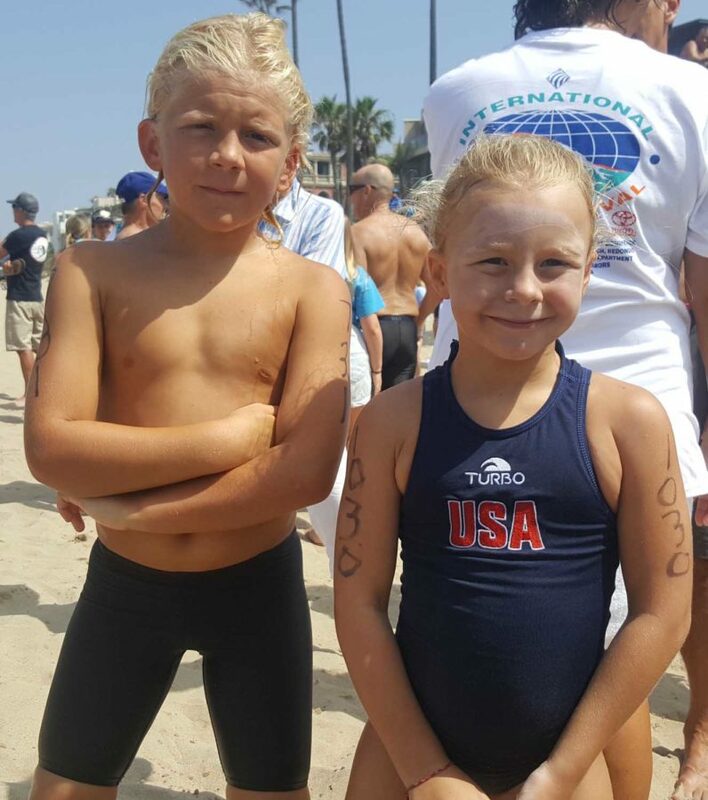 This year, Adelei was one of four Mosteller siblings to compete in Sunday’s International Surf Festival Two Mile Dwight Crum Pier-to-Pier swim. The race starts on the south side of the Hermosa Beach pier and finishes on the north side of the Manhattan Beach pier. Adelei finished 946th out of 975 swimmers, in a time of one hour, 35 minutes and 35 seconds. Brother Parris, 16, was 7th overall in 44:07. Brother Sawyer, 14, was 65th overall in 49:39. And Emmory, 9, was 165th overall in 1:29. Racing in the Pier-to-Pier is a rite of passage for the Mosteller family, according to their mother, herself a swimmer. She allowed her boys to compete in the Pier to Pier only after they had turned 9 and completed a year in the LA County Junior Lifeguard program. But this year, as Emmory prepared for his first Pier to Pier by entering the pre-race 500 meter check-out swim in July, Adelei asked if she could enter the race. “She told me, don’t worry mommy, I won’t be last,” Brandy Mosteller said. Crum said what impressed him most about Adelei wasn’t her physical ability, but her mental focus. “It’s gotta be more mental than physical. That’s the hardest part of a race of this magnitude,” Crum said. According to Brandy Mosteller, Emmory was asked after the finish if this was the best thing he’d done all year. “He said ‘second best.’ He’s on the Trojan water polo team that just finished second in the nation, and that was his first favorite thing, but this was his second favorite,” Brandy said. This week, Parris will compete in the US National Lifeguard Championships, in Virginia Beach. Adelei will get right back to training, however – both swimming and in gymnastics.